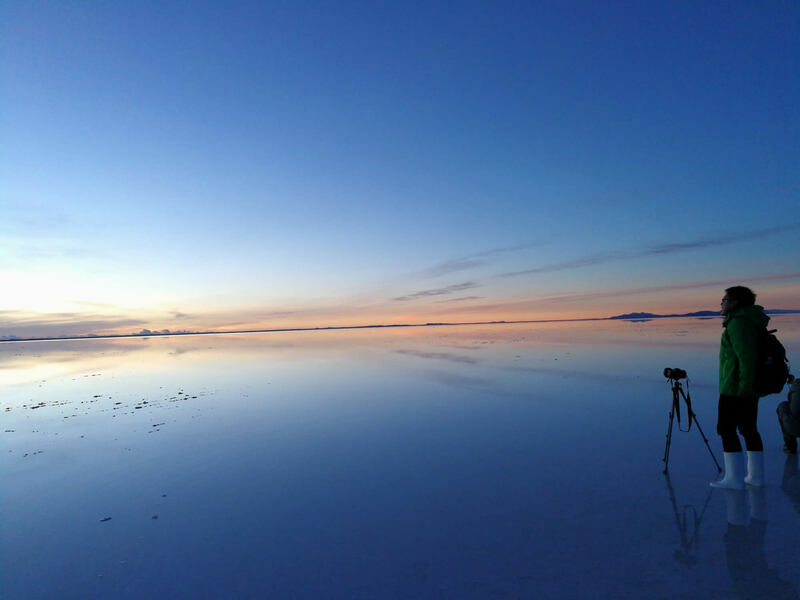 Home » Travel Articles » Uyuni » When is the best time to visit the Uyuni Salt Flats? Late April is the perfect time to visit Uyuni, as you can expect to see both the dry salt desert and the giant mirror effect. It is not as cold as in winter and rainfall is limited. The smaller number of tourists also means that you can get better deals for hotels and tours. If you want the best climate, visit between September and November. If you want to see the wet salt flats, visit between December and April. Other than that, any time is good to visit the Salar de Uyuni. Each season offers a unique perspective and features. At the beginning of every year, the Uyuni Salt Flats in Bolivia becomes the largest natural mirror in the world. As this giant desert of salt is covered by water during the rainy season, it reflects light creating almost impossible optical illusions. This time of the year is highly popular with tourists for visiting Uyuni. It tends to rain the most in February, but this can be quite unpredictable. Also, be aware that too much rain will melt the salt and make large parts of the salt flat unaccessible for tours. During and after New Year's Eve some tours don't leave. Be sure to check in advance if you plan to travel during these dates. When can I see the mirror effect? In summer, between January and March. Generous rains fall on the bolivian highlands, turning the Uyuni Salt Flats into something similar to a giant lake a few centimeters deep. In some years, depending on precipitation, you can still see this effect in the beginning of April. Does the water cause difficulties for the travellers? Depending on the amount of water that accumulates, access to Incahuasi and Fish islands can become restricted for safety reasons. During the rainy season the tours are often limited because the melted salt is dangerous to traverse. Several rivers deposit their sediments in the Uyuni Salt Flats and the water accumulates on the nearly waterproof salty surface. Another less-known attraction is the large number (around 25000) of flamingos that gather at the Red Lagoon in the Eduardo Avaroa Reserve during the rainy seeason for mating. There are far fewer tourists during these months, so you can get better deals from tour operators. The weather is still warmer and with a good guide you can find some places with water to see the mirror effect. Winter. Dress warm. Take extra blankets. The Salt Flat is a huge white beach-like desert during this time. It almost never rains, but can get bitterly cold. These months are less cold, still dry with occasional rains. In general, you can expect sunny warm weather during the daytime, and freezing, bone chillingly cold winds at night.